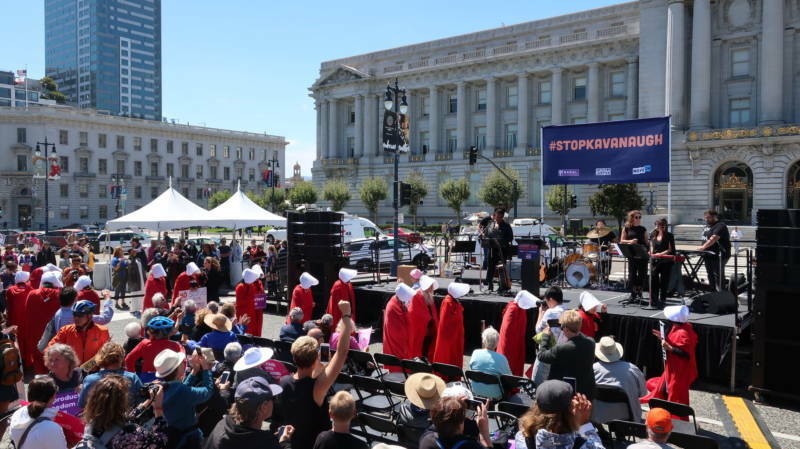 At Civic Center Plaza on Sunday, some demonstrators held signs that said "Kava-Nope" and "Stop Kavanaugh," while others shouted slogans like "This Justice? No Peace!" There were speeches, live music and a select group of protesters dressed in the red cloaks inspired by "The Handmaid's Tale." 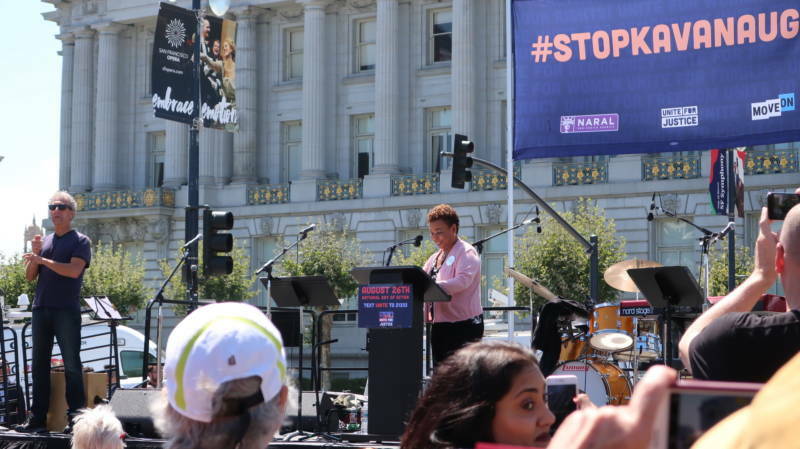 The demonstration was part of a nationwide action co-sponsored by the pro-choice group NARAL protesting Supreme Court nominee Brett Kavanaugh, who was chosen by President Trump after the resignation of Justice Anthony Kennedy in late June. "Primarily, for me, it's really the environment," says Megan Penrose, who came from Marin County with her 9-year-old son. "Every year, especially living in Marin, we see fires and I think we really don't have a day to waste." 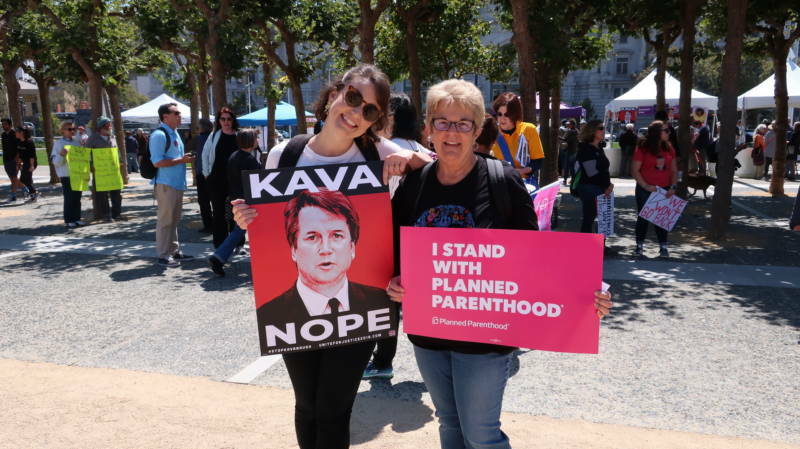 Others, like Jenna Hornbuckle, felt concerned that she didn't know what positions Kavanaugh held. "There needs to be more research into his public documents because we don't really have an idea of what his views are on important issues," says Hornbuckle. "I want somebody who's going to be fair and not give into politics when they're making such important decisions for the country." 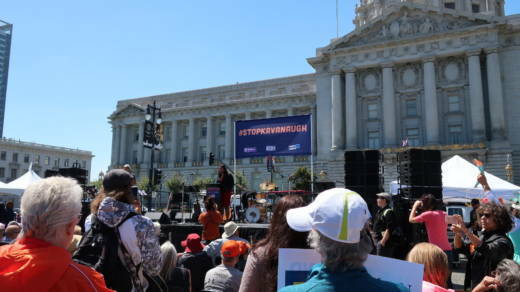 Among the demonstrators were several Bay Area officials, including San Francisco Mayor London Breed and East Bay U.S. Rep. Barbara Lee. During her remarks, Lee stressed that a confirmation of Kavanaugh would have wide-ranging impact. "We can’t let anyone interfere with our democracy. Not Russia, not the White House, not the Supreme Court," says Lee. "It's too important."